Authentic looks, heights and profiles are the specialty of Harkaway Homes. Established in 1986, Harkaway Homes markets its homes in New South Wales, Victoria, South Australia, Tasmania and southern Queensland. Its designs have attracted attention in the building industry and it has won the Master Builders Association Excellence in Housing Award four years running. There are 11 ranges of homes to choose from for those looking for something traditional. 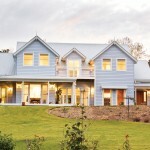 Featured is the Seddon, one of a range of eight different sizes and floorplans. Price: $101,609 deluxe lock-up package (price includes GST). Accommodation: Four bedrooms with built-in robes, living room, family room, dining room, two bathrooms, kitchen with walk-in pantry and laundry. Construction time: 16 weeks, mainly built on a project-managed basis. Construction: Choice of either weatherboard or brick, Colorbond or old-fashioned galvanised-iron roofing, Victorian ash windows, Victorian dress accessories, hardware and fixings. Not Included in price: Internal linings, plumbing, electrical, kitchen and floor. 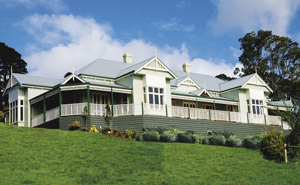 Optional extras: Verandah (four types as package), three-metre ceilings, timber block front façade, assorted leadlights. Featured is the Caulfield, from a range of seven different sizes and floorplans. Price: $115,571 deluxe lock-up package (price includes GST). Accommodation: Four bedrooms, living room, meals/family room, kitchen with walk-in pantry, laundry and two bathrooms. Construction: Choice of weatherboard or brick. Special features: As the name suggests, the Harkaway Homes Fair Dinkum Federation Series Caulfield is an authentic reproduction Federation home with a wide range of traditional features. 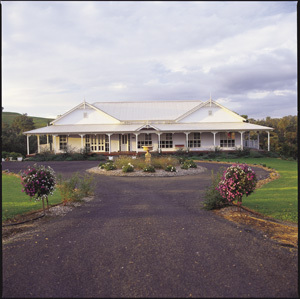 These include high external walls (3.6 metres), high ceilings (three metres), a Federation roofline, integrated verandah, leadlight-topped box-bay windows, leadlight front-door frame with cricket-bat entry door, Federation-line casement windows, Federation friezes and French doors. Included in price: Fully stabilised, prefabricated, termite-resistant, kiln-dried wall frames and roof trusses, full-frame erection, choice of brick or weatherboard, Colorbond roofing, Victorian ash windows, Federation cappings and fixings. Optional extras: Terracotta roofing and cappings. Featured is the Rokeby Pavilion Courtyard, one of a range of seven different sizes and floorplans. Price: $102,698 deluxe lock-up package (price includes GST). 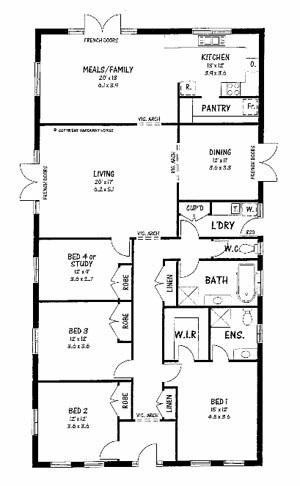 Accommodation: Four bedrooms, study, family room, lounge room, dining room, rumpus room, kitchen with walk-in pantry, two bathrooms and laundry. Construction time: 16 weeks, mainly built on project-managed basis. Construction: Either brick or weatherboard. Special features: This authentic reproduction Victorian home features a wide range of traditional features including high exterior walls (3.6 metres), period roofline, old-world cappings and finishes, high ceilings, casement windows and French doors. Included in price: Fully stabilised, prefabricated, kiln-dried wall frames and roof trusses, full-frame erection, choice of brick or weatherboard, Colorbond or old-fashioned galvanised-iron roofing, Victorian ash windows, Victorian dress accessories, hardware and fixings. Optional extras: Verandah (four types as package), three-metre ceilings, assorted leadlights.